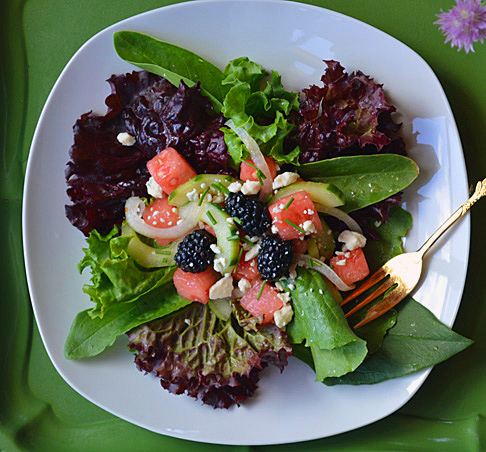 Welcome to the third post in our Summer Salad Series. Please visit the links above for the first two post in this series. It has been a bunch of fun researching salads (and eating them too)! I hope you are enjoying it as much as I am. When you think of Fruit Salads you probably think of the holiday season with the nice fruity salads we tend to associate with Thanksgiving and Christmas. 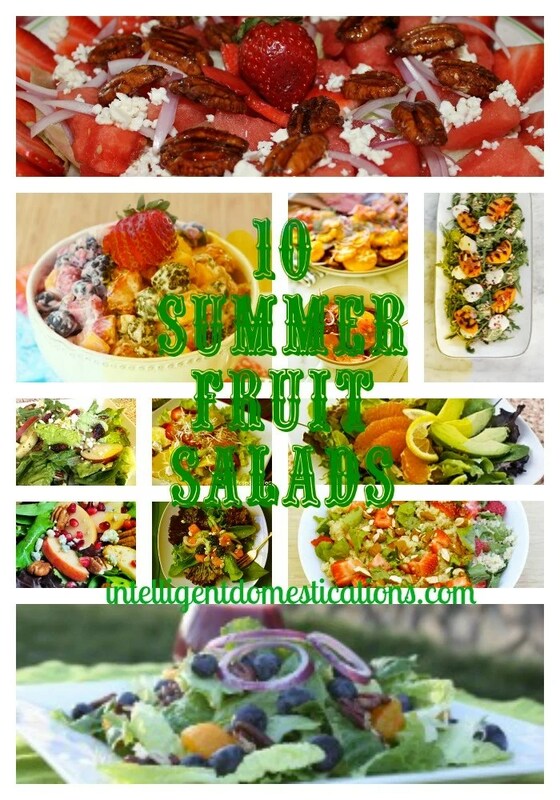 Summer salads have long been enhanced with the addition of fresh seasonal fruits. I hope you will be inspired to try a fruit combination which you not have otherwise considered. 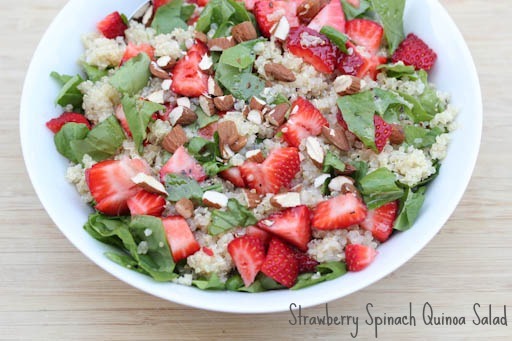 I purposely left out the traditional spring mix greens topped with strawberries, pecans and feta. We all know how to make that because it is so delectable! This scrumptious Watermelon salad has the perfect combination of sweet and salty. Have you ever put salt on your watermelon? Many people do. 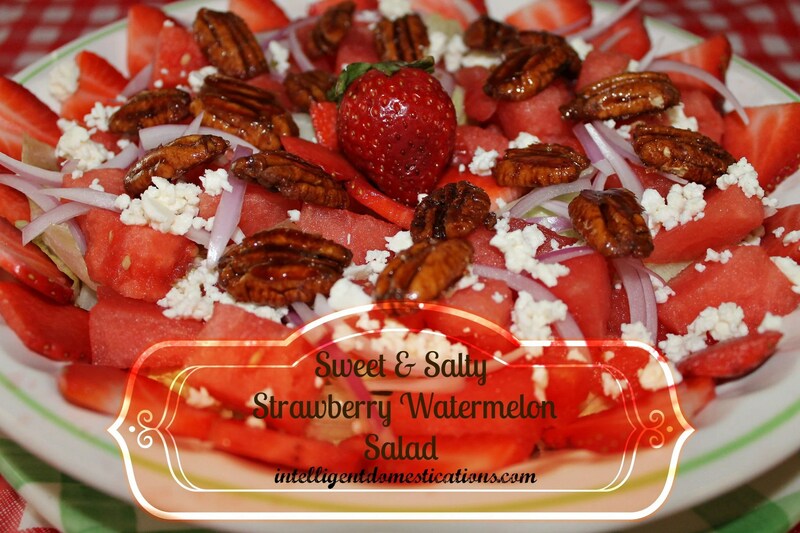 Strawberries, watermelon and sweet and salty candied pecans are just a few of the yummy ingredients in this recipe. Go here for the printable recipe. The recipe for the Sweet & Salty pecans in also there. This in my creation and a big hit! 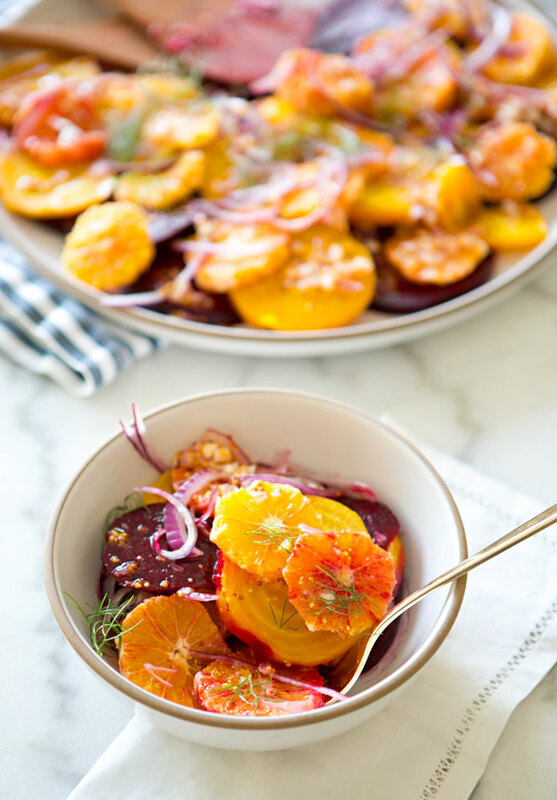 This colorful Beet And Blood Orange Salad is by Sarah of A House In The Hills. Won’t you agree this is a very different and enticing salad choice! Good beet recipes are hard to find. You can find this recipe here. Mmmm, is what I was thinking when I first saw this Mango Berry Crunch Fruit Salad by Brianne over at Cupcakes & Kale Chips. The dressing is a Greek yogurt and orange marmalade mixture! Don’t you love salads with some ‘crunch’! I do! Please go here for the recipe. Robyn over at Add A Pinch has hit one out of the park with this colorful and yummy Apple Pear Salad with Pomegranate Vinaigrette! I agree with Robyn that this salad would be perfect for anytime during the Christmas season. I don’t think I will wait until Christmas to try this! The free printable recipe can be found here. First just let me say that Marilyn’s Treats is a blog you will want to follow. Marilyn produces some of the most scrumptious looking recipes I have seen! 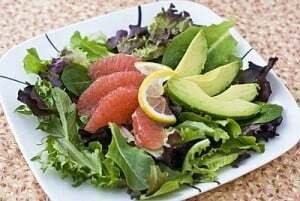 You can find a printable version of this Grapefruit Avocado Salad here on her blog. 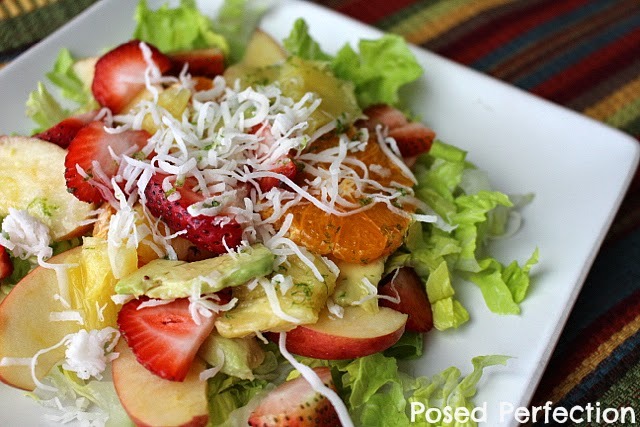 Nici at Posed Perfection has this nice Mexican Fruit Salad with all of the best fruits included! Won’t you agree this is such a colorful and appealing salad? You can find the recipe here which includes 4 different fruits paired along with avocado and a few more yummy ingredients. This Mixed Greens Summer Salad from Shari at Pure Grace Farms boasts a colorful combination of lettuce, arugula and spinach. Some of the tasty ingredients include berries and watermelon. 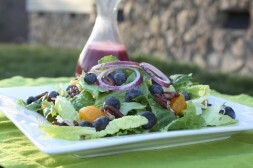 Go here for Shari’s very thoughtful post with lots on great salads information and the detailed recipe. Did you just think to yourself, Wow? 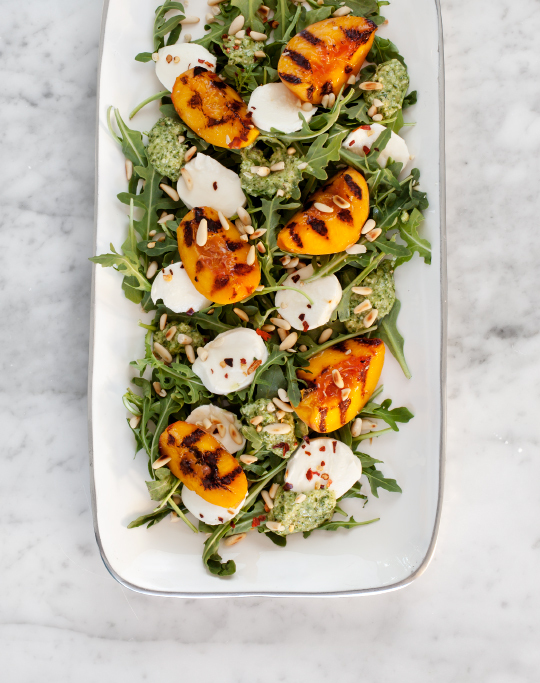 Because I live in the Peach state, I feel like I should have long ago considered making a grilled peach salad! The printable recipe can be found here at the Love & Lemons blog by Jeanine. This salad has been a huge hit on Pinterest! Erin over at $5 Dinners created this light, tasty but filling combination of ingredients. The price is right coming in under $5! It looks appetizing, doesn’t it! Go here for the printable recipe. Georgiablueberries.org provided us with this super yummy looking salad featuring Georgia Blueberries and Mandarin Oranges! The recipe is available here. Surprisingly, Georgia is expected to move from being the number two producer of blueberries to the number one state producing Blueberries! The Peach state could be called the Blueberry state! I certainly hope you are enjoying all of the Summer Salads as much as I am! Please follow us on Pinterest here. Our Summer Salads board is here. 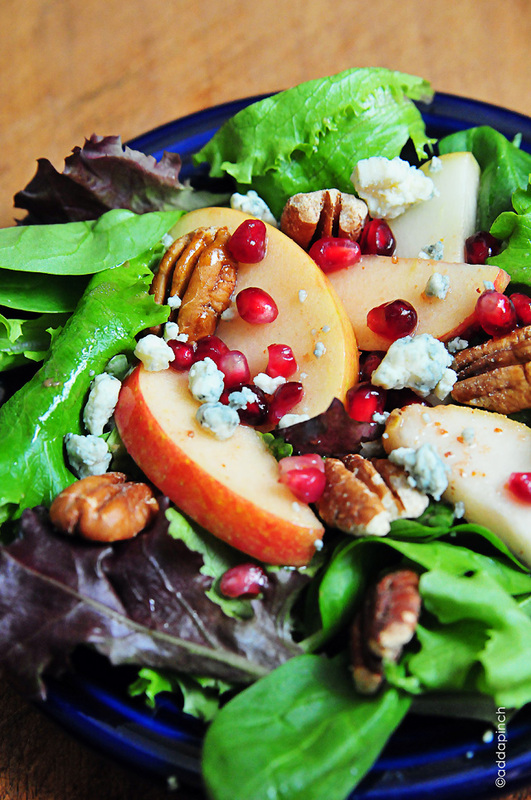 What is your favorite fruit to add to your salads? You are so right about finding good beet recipes. I’m going to check that recipe out. Hope you have a great day. Looks like some amazing salads here! I’m definitely going to take a peek at them. Thanks Marie. I had not considered putting salmon on a salad, don’t know why but now I will! We have beets growing in the garden and I’m looking forward to trying them in your beet salad recipe! Thanks for sharing. I love beets but have actually never tried them in a salad. I’m looking forward to working my way through some of the great salads we are sharing. Thanks for stopping by, Lavende. Those salads sure look good. I like the ones with the crunch in them. I am a huge fan of nuts in my salad. 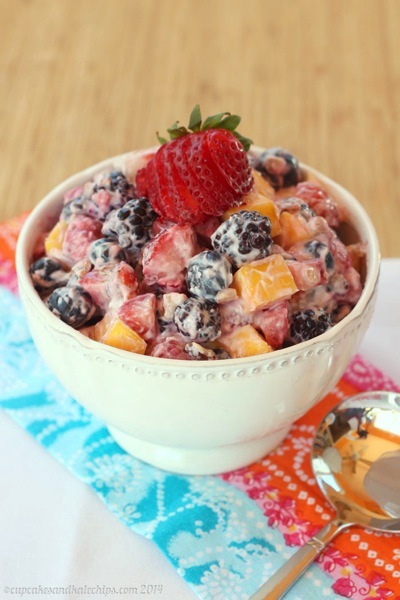 The mango, berry, crunch looks really tasty – I checked the recipe out and it is supper easy! This is mouthwatering, all of them! Thank you, pinning! There are so many luscious salads to choose from in this series. I want to try them all. My mom brought me her favorite strawberry dressing when my parents visited last weekend. It’s the same exact one that you shared. I’ve already made it, took pic and written the post about how good it is!